TrackerPro offers a number of industry specific calculators listed below that can be easily added to your website and branded to include your logo and other relevant information. Each of these optional calculators allow your employees and clients to effortlessly enter information online and determine such things as their amortization schedule or a good faith estimate entirely on their own. All of our calculators are constantly being updated to reflect any rate changes, etc. so there will never be a discrepancy between our figures and the actual amounts. Good Faith Estimate (GFE) Calculator Option – allows you to configure your own closing costs and provide easy access for your clients to look up and determine all costs associated with your title charges. An additional feature allows you to automatically generate a GFE HUD from the data entered. Our team will customize this application for you and add it to your website while ensuring it conforms to your current sites look and feel. 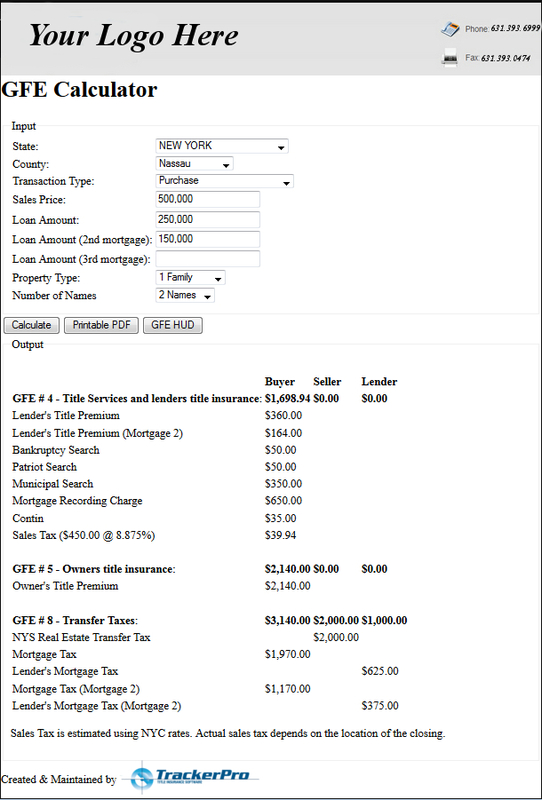 Title Rate Premium Calculator – provides you and your clients estimated mortgage taxes, title premiums, and title charges for all states. Click here to access the Title Rate Premium Calculator. Amortization/Mortgage Rate Calculator – provides you and your clients with a breakout of actual monthly payments based on the principle, interest rate and term specified. For more information and to find out how you can begin using these calculators, please call Howard Finkelstein at 631-393-6999 or send an email to info@trackerprollc.com.